Wow — what a beautiful bird! 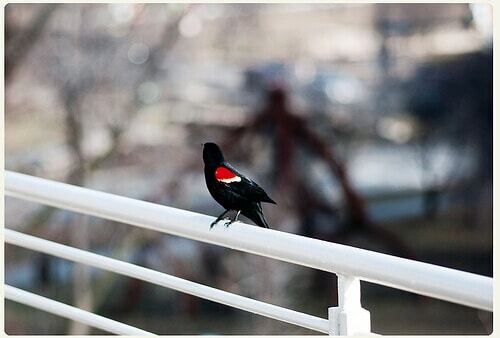 I have never seen a black bird with red on the wings like that before! Oh yes, it is SUPER common around here, you can learn more about the red-winged blackbird via all about birds! They have such an amazing flash of color reminds me of being a kid and visiting the pond nearby my grandmothers farm where they nested. They have flown by my home now and then over the years. Oh I think they are such pretty birds! I am always attracted to brightly colored birds, we plan on installing a bird feeder into the backyard soon! This is so beautiful. I am not an expert (in fact I know nothing about photography! ), but you appear to be very talented. Aww thank you so much!!! That means a lot to me! Great photos! I could hear the song in my head as I looked at them. Thank you! I am a HUGE Beatles fan. Very nice photo. 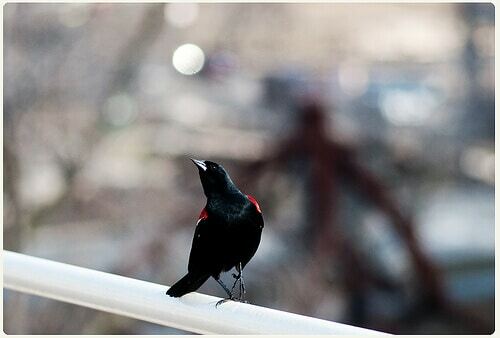 I love how the red pops against the black bird. And happy birthday to your brother! Aw thank you! I wasn’t able to get ahold of him today sadly, but I’m sure he had some green beer at least! fantabulous blog and fantastic post! 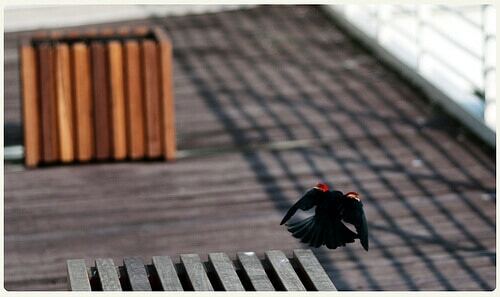 Great photo of the blackbird in flight. You managed to get it in focus nicely. Thank you! I still wish I had gotten even closer but I was wearing the baby at the time and I’m fairly certain the bird would have flown off if I approached with the raptor baby lol. Nice series. 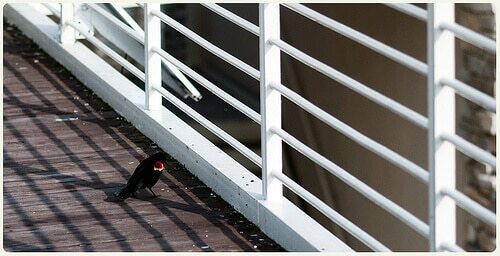 We have red-winged blackbirds around here, but I’ve never seen them in my yard. I don’t see them in our yard so much but see them a LOT at the parks around here. I especially love that third one, with that splash of red. What beautiful pictures. I love how you caught it in mid flight! What camera do you use btw? I recently switched to the Nikon D90 after using the D50 for four years! Just seeing the Black Bird reminds me so much of The Beatles. Love your shots. Happy WW! I’m so glad! I am a HUGE Beatles and Lennon fan! Did he finally take off and fly??!! Love the shots! Thank you! Oh yes, there was a LOT of them at the nature museum that day, this fella was the only one that wasn’t flying around so much! A few summers ago I had to do a lot of driving between my town and a neighboring town and I would always see hawks and these weird black birds with red wings… but the red always seemed to be on the underside of the wing. Anyway, I’ve wondered about them for a while. Glad you posted about them! Thank you so much! Oh yes, a few years ago I had NO clue what kind of bird it was, so I took it upon myself to research them a bit since they are so local! Great photos! Any tips for photographing birds? I’ve been dying to get some shots of the zillions of Cardinals that hang out in our yard. Hmm for tips, telephoto lens, tripod if possible, and patience!! OMG the Cardinal is one of my FAVORITE birds. We have a female and male that tend to hang around our backyard every so often, love it! I know right!! There actually was a lot out that day! That is a really pretty bird! Absolutely stunning shots, too! Thank you! I love the coloring especially against the black! Such a classic combination with the red! I completely agree! I love the coloring so much! Absolutely gorgeous. The blog title is sad, though. I hope you’re feeling better, hun. Oh my gosh I haven’t seen a Red Wing Blackbird in so long! Very pretty!